Today’s post is a multi-tasker. It is my post for Lazy Susan, but also my contribution for Week 10 of 12 Weeks of Christmas. This is one hard working little cookie. For Lazy Susan, we are doing a virtual cookie exchange. If you start here, and click around from blog to blog, you will come away with quite a few new and delicious cookie recipes. 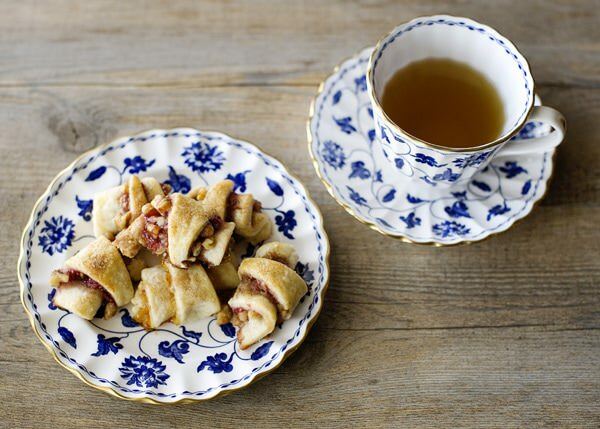 If you have ever had rugelach before, than I do not have to tell you that it is a cross between a pastry and a cookie. 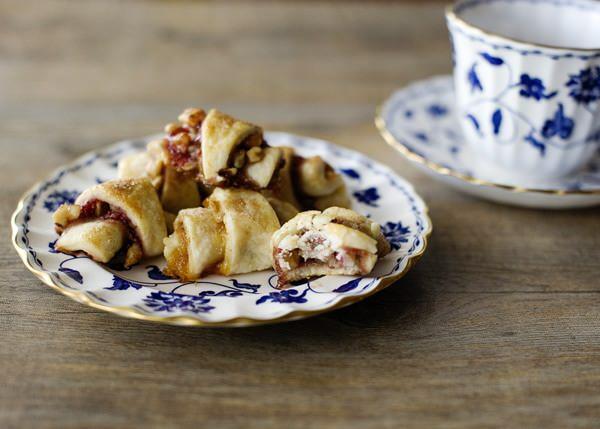 The crust is a tender and flaky cream cheese pastry, slathered with jam, then sprinkled with a cinnamon-sugar-walnut mixture, rolled into a little crescent shape, and sprinkled with cinnamon sugar again. Baked until golden brown, with melty jam oozing out of the seams. These are a treat. They sell them in delis on the East coast, and whenever I see them, I have to have some. They come in all sorts of flavors, apricot being the most traditional, but there are chocolate, raisin, all kinds. The other wonderful thing about this cookie, is that it freezes like a dream. Make a batch now, and you can enjoy them at Christmastime. 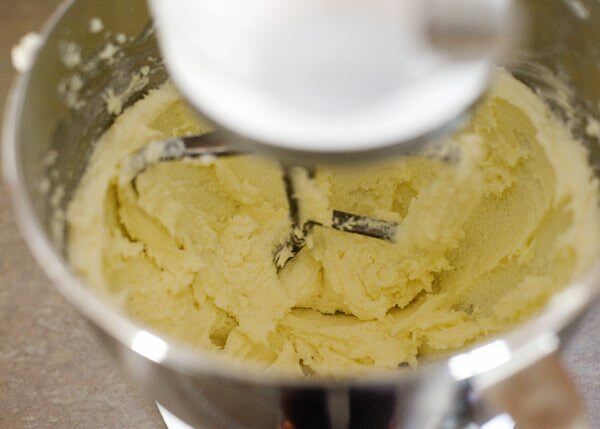 Cream together the cream cheese and butter until light and fluffy, about 5 minutes, scraping the bowl periodically. Add 1/4 cup sugar, salt, and vanilla. Add the flour, and mix until it just comes together. 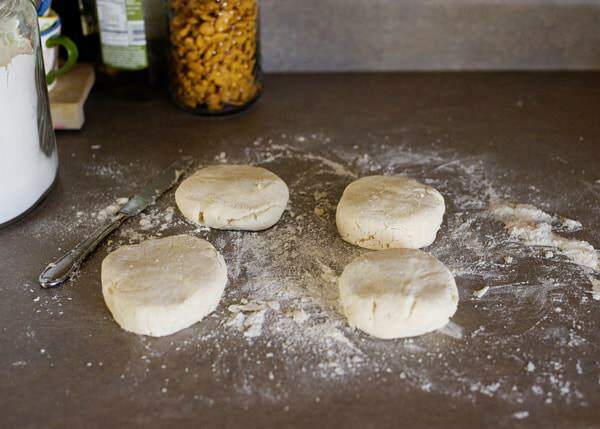 Turn the dough out onto a floured board. Roll the dough into a ball, and cut into quarters. Flatten each out into a disk, and wrap in plastic wrap. Chill in the fridge for 1 hour. Meanwhile, make the filling. 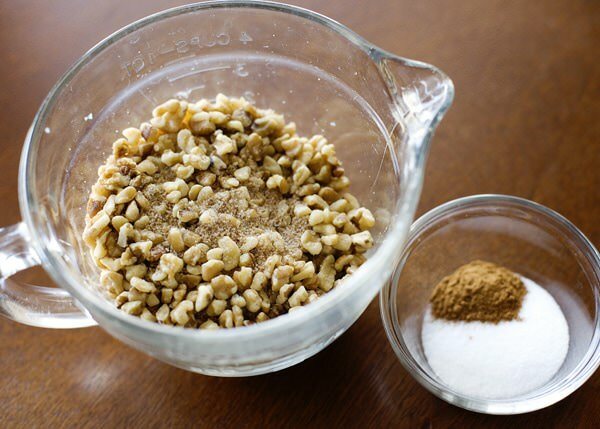 In a small bowl, combine 6 Tablespoons sugar, brown sugar, 1/2 teaspoon cinnamon, and walnuts. Set aside. 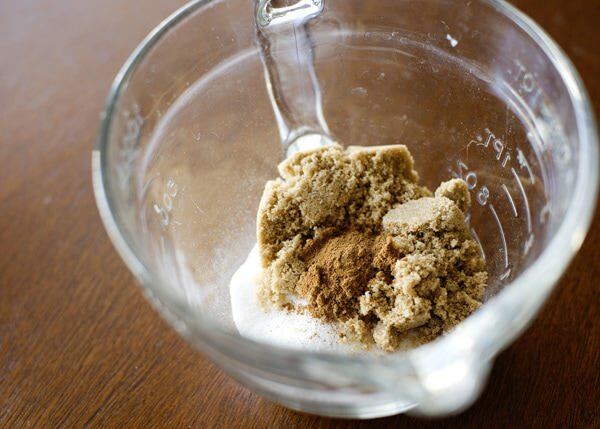 In another small bowl, combine remaining 3 Tablespoons sugar and 1 teaspoon cinnamon. 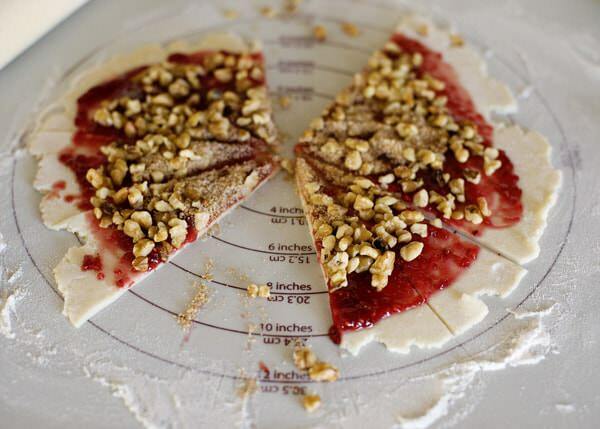 Roll the dough out into a 9-inch circle. As you can see, mine is not perfect. 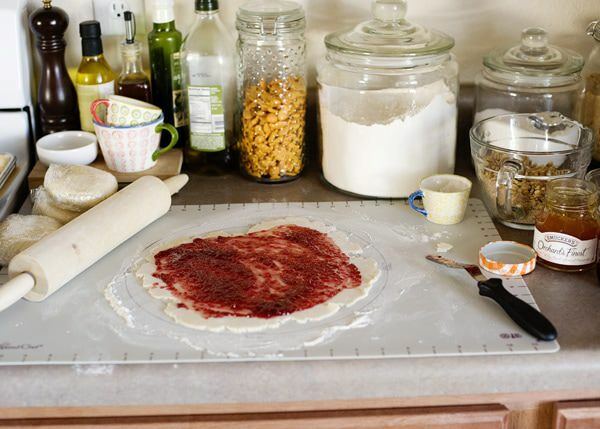 Spread a few Tablespoons of jam on to the crust, leaving about an inch bare. 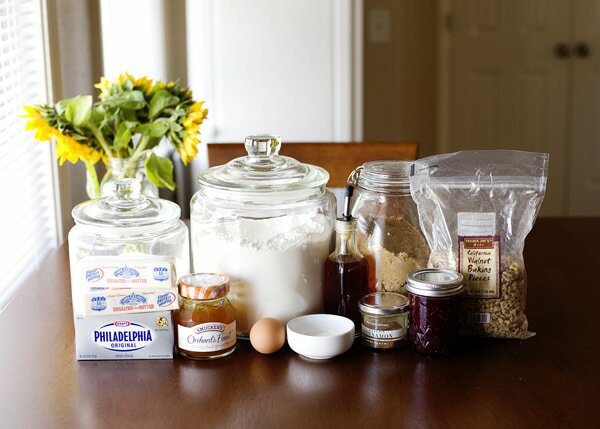 Sprinkle a generous amount of the walnut mixture on top of the jam. 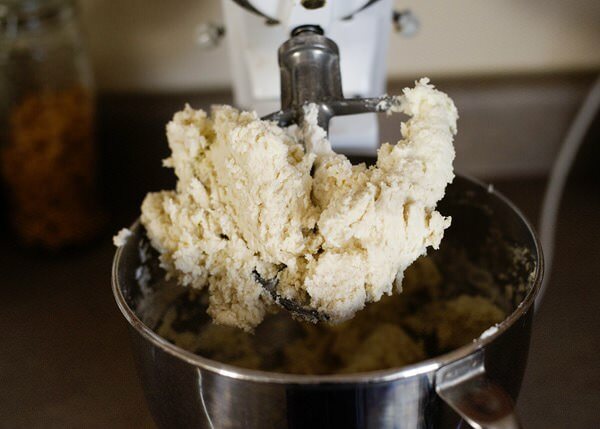 Roll up the dough from the widest end to the shortest. Chill the rolled cookies for at least one hour before baking. Beat the egg with a drop of milk. 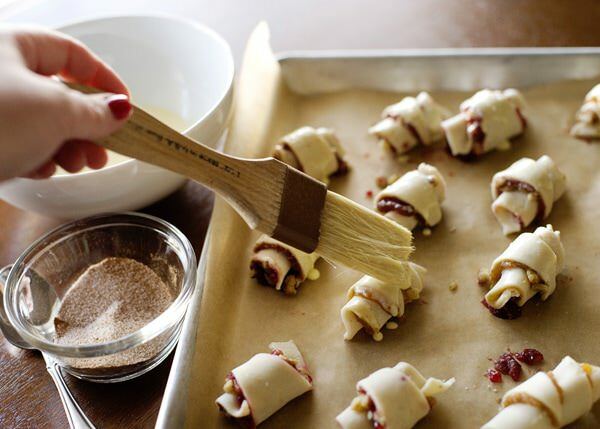 Brush the tops of the rugelach with the egg wash and sprinkle with the cinnamon sugar mixture. 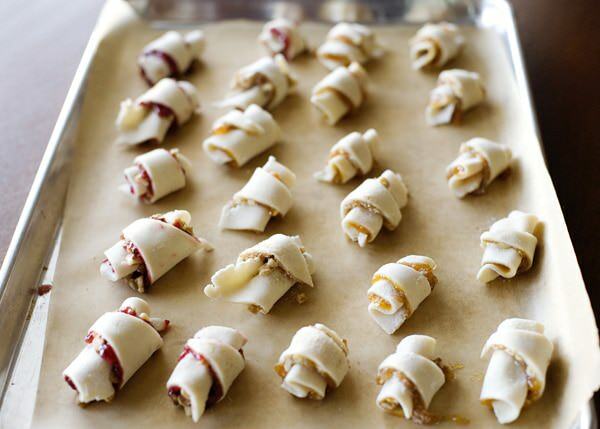 Rugelach freeze like a dream, so you can make them up to a month in advance. Adapted from GOOP and Chozen. Ready for the next cookie? Head on over to Amanda Prince’s blog to see what she has baked for us. Bree, these look awesome, but remind me of a cookie my family makes by a different name which I can’t think of right now. I’ll have to look it up and see if they have any similarities. Kolache was the name of the cookie I was thinking of, but now that I look it up on the internet, they don’t look so alike after all. Oh well! LOL Brandon, you should make them and see if they taste the same to you. This looks amazing. Gonna save this recipe! Ragazzi ma state parlando senza coiinzgone di causa, ormai il gioco completo e verr rilasciato in europa il 19 di questo mese e se volete dei video andate su youtube. Un gioco per essere rilasciato in Europa dev’essere pur per forza multi5. 16 per circle, so about 64. 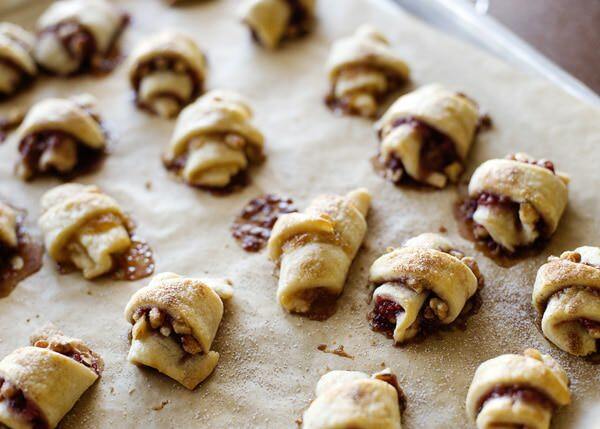 Rugelach is fantastic! A staple I grew up on. Though given that Hanukkah and Christmas overlap this year, it’s a touch odd to refer to this traditional Jewish treat as a Christmas cookie and not mention its origins at all. Even the name is Yiddish. I didn’t even know that Hanukkah and Christmas overlapped this year, I didn’t mean to offend you, I just really like the cookie. Definitely not offended. Just wanted to point out the origins of the treat we both clearly adore. Cheers and Happy Holidays to you! These look great! I’m not the best at rolling out doughs, more like the worst, but think I will try these. How many wedges do you cut each 9″ circle into? Looks like maybe 16? Thanks Bree! bree i love your step by step photos and these are so pretty I am sure they are as tasty as they look. Must make these soon, they sound divine! Bree these cookies look delish…but i have a question…at what point can i freeze them? would you freeze before, or after baking? Oh yuminess. I want some now. Hmm i wonder if the teen will make these for me tonight? Bree. 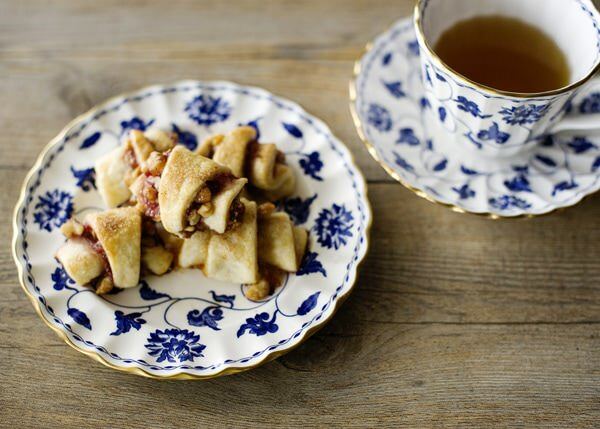 That china set is gorgeous….but more importantly, that Rugelach is so beautiful on it! Cannot wait to surprise my MIL with these! She will be so excited! thank you Sara. It is my wedding china, my mom has the same pattern. These look delicious and I loved your description of them. I love when jam oozes out of cookie and treats, I think it tastes better when the delicious filling peaks out of pastry. I LOVE rugelach. They are my favorite Jewish cookie. I’m partial to the chocolate chip ones. They are like Lay’s potato chips to me…I can’t eat just one. Me too, love them. I love the cinnamon ones. These are beautiful! I am definitely adding these to my cookies to bake for the holidays. I know they would be a hit! I am flattered that you are adding these to your baking list. They look a lot like tiny croissants, don’t they? Sounds delicious! And I love your photography, as always. These look amazing. We love rugelach at our house. I have the same question, at what point would you freeze them…before or after baking?? Thanks for the recipe. You can freeze at either point. But I prefer to freeze before baking. Then brush with egg wash, cinnamon sugar, and then bake. What is the brand/name of that beautiful china?! It is Spode, Blue Colonel. It is the same pattern my mother has, it is my wedding china. I love these Shannon, they like little baby croissants. Bree these look phenomenal…I love your blog!!! I am drooling looking at these cookies…. I started a diet yesterday and I’m suffering looking at these…lol…. Not a good time for a diet! Do you freeze them when they’re baked or before? Which way freezes better? I think that I would freeze baked. Either is fine and I have don’t both, but it’s nice to just thaw and serve.